Dr Glenn Davies examines Mary Shelley's timeless cautionary tale, our endless fascination with fictional monsters — and Barnaby Joyce. 2018 MARKS THE 200th anniversary of the publication of Mary Shelley's classic novel, Frankenstein, about the young scientist, Victor Frankenstein, and the monster he created in his laboratory. The captivating novel was first published in January 1818, on the heels of the Napoleonic Era, under anonymity. The genesis of the tale is well known. During a stormy night in June 1816 – known as the Year Without a Summer – in Switzerland, 18-year-old Mary Shelley was challenged by Romantic poet Lord Byron to a ghost-writing competition along with Percy Bysshe Shelley, who would later become her husband. Her idea became the kernel from which the Frankenstein novel would emerge. The novel originally received mixed reviews but came into prominence after being picked up by theatre companies a few years later. It was not until the second edition five years later in 1823, that Mary Shelley was attributed officially as the author. Its core story – of a recklessly ambitious and naïve scientist whose human-like creature arouses only horror and disgust, and escapes control to seek revenge on his creator – has become, for better or worse, the techno‐scientific fable of modernity. First adapted for the stage by Richard Brinsley Peake in 1823 – and later for film by Edison Studios in 1910 – the story has inspired more theatre, film, television and other adaptations than any other modern narrative, with more than 50 screen adaptations appearing in the 2010s alone. From Fritz Lang’s 'Metropolis' to Alex Garland’s 'Ex Machina', and 'The Rocky Horror Picture Show' to 'The Addams Family', the Frankenstein myth reaches into every recess of high and popular culture. Every day, newspapers and online feeds produce more headlines from the frontiers of modern science. Of course, with these advances come anxieties about Faustian bargains and Pandora’s boxes. 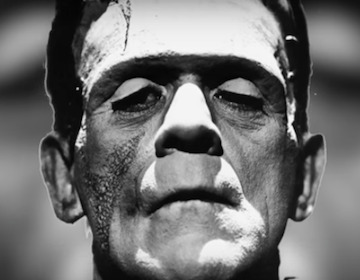 The greatest stories tap into the cultural anxieties of the time: Mary Shelley’s Frankenstein and the Industrial Revolution; Dracula and Victorian prudishness; Invasion of the Body Snatchers and the Red Scare of the 1950s; and since 9/11, there has been an abundance of apocalyptic and post-apocalyptic narratives. All of them have to do with our fear: fear of disease, fear of environmental devastation and fear of nuclear annihilation. It appears nearly two centuries after its anonymous publication on 1 January 1818, that Mary Shelley’s Frankenstein remains as topical as ever. No work of literature has done more to shape the way people imagine science and its moral consequences than Frankenstein. Mary Shelley’s cautionary tale has been an enduring story of creation and responsibility. The idea of the dead rising isn’t new. The fictional living dead have been around for centuries. However, it has been since the early 19th century that zombies and vampires have shuffled and flown in and out of our social consciousness to thrill, chill and revolt. Over the past ten years, we have seen Brad Pitt’s blockbuster World War Z, 28 Days Later, "rom-com-zoms" such as Shaun of the Dead and Pride and Prejudice and Zombies, or TV series, such as Dead Set, In the Flesh, or iZombie and Z Nation. The greatest current zombie series is the global sensation, The Walking Dead. Now in its eighth season, The Walking Dead is an American post-apocalyptic horror television series that has recently returned to begin its final episodes on 25 February 2018. The Walking Dead premiered in the United States on 31 October 2010, exclusively shown on cable television channel AMC and is based on an ongoing comic series of the same name. The Walking Dead takes place after the onset of a worldwide zombie apocalypse. The series centres on sheriff's deputy Rick Grimes, who wakes up from a coma to discover this apocalypse. He becomes the leader of a group of survivors from Atlanta as they attempt to sustain and protect themselves — not only against attacks by walkers but by other groups of survivors willing to assure their longevity by any means necessary. In modern popular culture, zombies are closely tied to the idea of an apocalypse caused by the collapse of civilisation. There’s something eerily attractive about post-apocalypse scenarios — the lack of people, the debris of the world we know, the need for survival and call to adventure that they enforce. It's been recognised that zombie popularity appears to peak when society is unhappy due to their ability to 'address fears that are both inherent to the human condition and specific to the time of their resurrection'. ... in the decaying body of the zombie our fears of mortality and desire for immortality are played out. Others suggest the dehumanised individual represents our fear of technology, science, drugs, rapid change, breakdown of community and civilisation and the disempowerment felt in times of economic and/or political crisis. Brisbane is very used to zombies shambling down the streets of its town. The annual "Brisbane Zombie Walk" began in 2004 with just 300 participants. By 2005, it had grown to 1,500 people as word spread on the internet. In 2006, some Brisbane burghers were freaked out when a horde of zombies shambled down Adelaide Street at the same time as the official opening of the revamped King George Square. This was scheduled as part of the "Thrill the World" zombie walk. World records are an important part of zombie marches around the world. On 25 May 2008, Brisbane set an unofficial record with over 1,500 participants. In 2009, another unofficial record was set, with over 5,000 participants. In 2010, the Brisbane Zombie Walk attracted a staggering 10,000 participants to actively join in the walk and raised $13,000 for the Brain Foundation. In 2011, the aim was to continue to raise in excess of $10,000 for the Brain Foundation and to officially break the Guinness World Record for the largest zombie walk attendance. The world record for the biggest zombie gathering was 4,093, set in the U.S. city of Pittsburgh. In Brisbane, they stopped counting at 8,000, which made it – at least unofficially – the biggest zombie walk in the world. The following year, 2012, saw the largest and the most successful zombie walk in the world with the event taking a whole new direction by an inclusion of a full music festival. As a result, over $55,000 for the Brain Foundation was raised. 2013 exploded all previous records. The annual Brisbane Zombie Walk became a world record-breaking Brisbane institution that gives the city a sense of fun and vibrancy. Much like the fictional undead, the Brisbane event was wiped out in 2016, after being cancelled due to rising council fees. This "end of the road" is something Nationals member for New England Barnaby Joyce has been contemplating for the past week or so. If the zombie represents a specific cultural or individual fear, then we may rest easy in its destruction — until it rises again, of course. Perhaps we should watch for the next rising of Barnaby Joyce from the back-bench. There will be events held all over the world this year to celebrate the 200th anniversary of the publication of Mary Shelley’s Frankenstein. History editor Dr Glenn Davies is the Australian Republican Movement's Queensland branch secretary. You can follow Glenn on Twitter @DrGlennDavies.